Steve Young of the New York State Department of Environmental Conservation, is the coordinator of the Long Island Invasive Species Management Area. He kindly agreed to share his knowledge of this new threat to the beaches of New York and the animals and plants that rely on them. 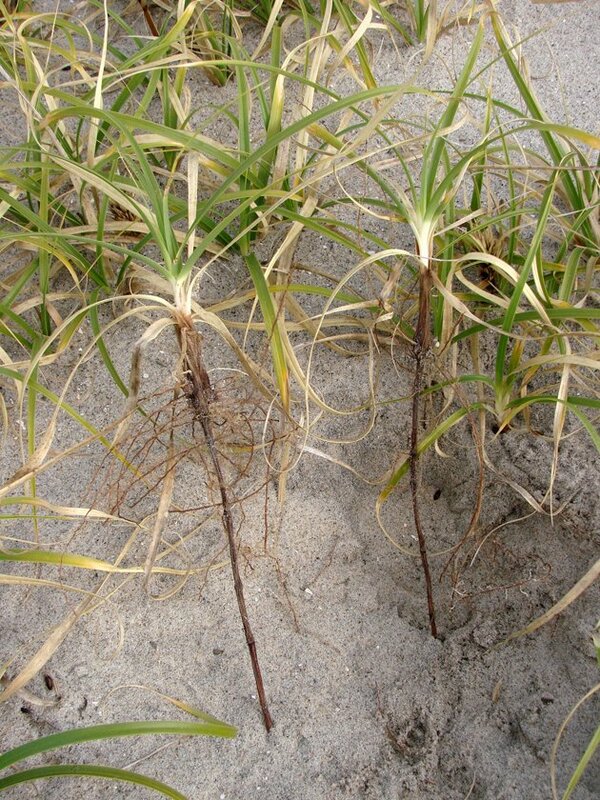 A new invasive plant is threatening the beaches of Long Island, Asiatic Sand Sedge or Carex kobomugi. 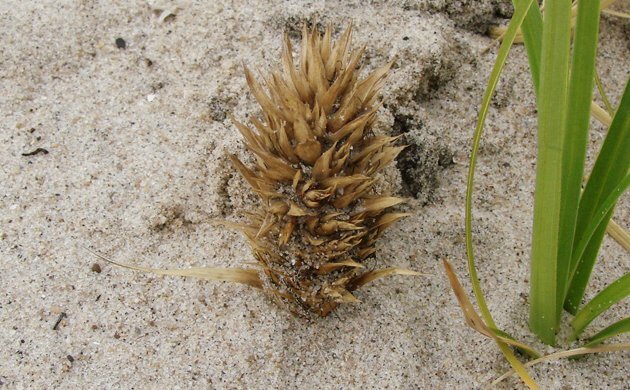 In the early 1900s this plant was introduced to the beaches of New Jersey from Japan and subsequently planted on many beaches there as an erosion control plant because its prolific rhizomes stabilized the sand. As with many invasive species, there were unforeseen consequences to the proliferation of the plants. 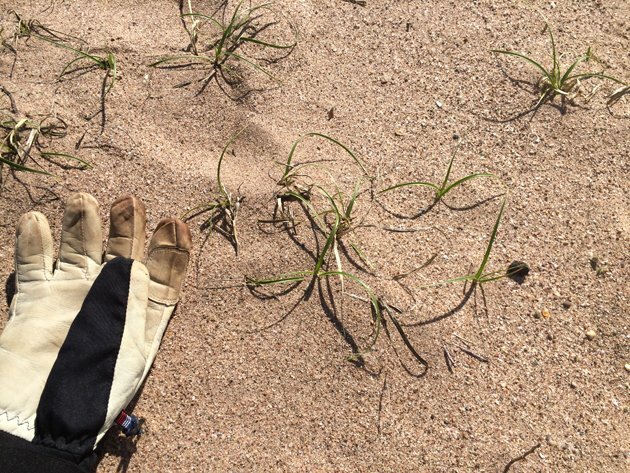 While the plants did stabilize the dunes, they also formed such dense stands that no other native dune plants or animals were able to live there including rare plants like seabeach amaranth and rare birds like piping plovers. The short stature of the plants also reduced the height of the dunes because they didn’t catch as much sand as the native dune grasses. The dense stands of leaves, with sawtooth edges, prevented people from walking through them as well. Over the years the plants have spread to fill hundreds of acres of New Jersey dunes including many acres at Sandy Hook of Gateway National Recreation Area, just 5 miles south of the beaches of Staten Island and Queens. This is a young plant producing a new white rhizome from its base. There are also many dark, fibrous, roots growing from the base. The bases of the leaves are white with a transition to green as the leaves spread out an arch over to touch the sand. This arching leaf is very characteristic of sand sedge. These plants have old dark rhizomes growing from the base which extend deep into the sand. While the environmental disaster was unfolding in New Jersey, New York beaches seemed free of the plants but that all changed in October 2012. A large patch of sand sedge was found on the beach at Arverne-by-the-Sea by botanist Heather Liljengren of the New York City parks department just before Hurricane Sandy hit. 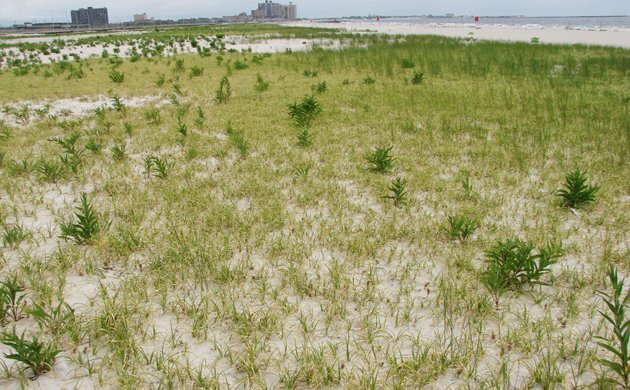 Surveys during the summer of 2013 found that many of the beaches of Breezy Point and the northeastern shore of Staten Island had many small plants scattered along the beach. There is no direct evidence but many of these plants were probably brought over from New Jersey by the hurricane because they were still so small and had not had time to develop large rhizomes. Another small infestation was found on Fire Island on a foredune that was washed away by hurricane Sandy. The biologists at the national seashore think that it was also spread there by the hurricane. 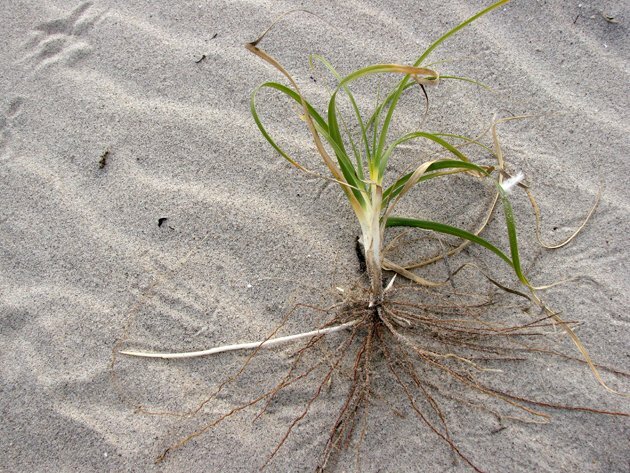 These are very young plants with narrow leaves but they still have that arching characteristic and most probably connected by rhizomes if you dig around in the sand. To remove them you must remove the connecting rhizomes too or they will resprout. This is the female flowering spike which is large and sits at the top of the sand on a separate stem. There are both male and female spikes. Most young plants do not produce spikes. Right now the infestations seem small enough that with a concerted effort they could be eradicated from New York beaches. We are concerned that, if left alone, the plants could spread to many other beaches on the island and crowd out nesting birds and native plants as well as diminish the recreation value of the beaches. The Long Island Invasive Species Management Area (LIISMA) is working with managers of the beaches to make sure that the plants are controlled and the threat is reduced. All beachgoers could help reduce the threat and protect our beaches and their inhabitants by becoming familiar with the look of sand sedge and report any new infestations they see to liismaprism@gmail.com. A Corn Crake in New York State!